Bound by Blood Volume One introduces us to the famous vampire Dracula before he makes his hellish deal with Lucifer. Known down through history as a bloodthirsty monster, he actually began his reign as the equally bloodthirsty ruler, Vlad the Impaler. In Dracula’s time however, rulers had to be heavy handed and ruthless. If they didn’t take a firm hold over their people, and stand strong against their enemies, they didn’t tend to last long. Wars were common, land borders frequently invaded. Dracula not only sent his men out to defend his territory, he led them in battle, usually right out front where it was most dangerous. This volume begins toward the end of one of these battles. Dracula is exhausted, his men as well. They believe victory over their enemy has been won and they want nothing more than a place to get down from their equally tired horses and rest. But they are taken by surprise when their foe sends in a small band of archers who manage to get around them unnoticed. They patiently waited until they had Dracula and his men trapped in a bottleneck area of the mountains, almost impossible to get everyone turned back before they are hit with an arrow. Most of his men are killed and Dracula himself mortally wounded. It is right after this that Lucifer shows up to offer him a deal. He will make the defeated ruler an immortal with power no man had ever had before. 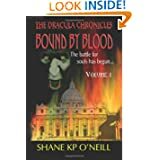 In return Lucifer expects Dracula to help him bring down the powerful Catholic Church. Angered by the loss he suffered at his enemies hands, Vlad accepts the deal. And so is born the most famous vampire of them all. In this volume we are given time to learn more about Dracula, his life, his thoughts, his needs as a new vampire. Lucifer has given him this time to figure out what he can, or cannot, do. What I found exceptional about the writing by Shane K.P. O’Neill was his ability to bring the vampire across as a real person, horrified at times by his own deeds. Yes, he is molded by evil and performs evil actions, but he was also human at one time, with human emotions and needs, loneliness, and perhaps a touch of fear, forcing him to learn things about himself he’d never faced before. As I found with the teaser, Birth of a Monster, the description given in this novel, though not overdone, gives a clear vision in the reader’s mind of the man, the land, and the difficulties the people of this time dealt with. There were times I felt as if I was right there beside them, watching–and not sure I wanted to be. A well set up beginning for what I expect to find an exciting series. Though I loved the story and description in this novel, more editing would have been appreciated with grammar and punctuation. There are also more typos than I expect to deal with. My slight irritation over these details was not enough to cause me to stop reading however, which tells you a lot about the great story and characters. There are a few sexually explicit scenes where torture and death are a bit difficult to read. I know I tended to skim over these parts to get back on track with the story, but not everyone will have as weak a stomach as I do. Great beginning. I plan to place a review for Volume Two shortly. Posted by Denna Holm on February 18, 2013 in Archives and tagged bloody, chilling, cursed, fantasy, history, Horror, sexual tension, tension level, thriller.